Warm a ramekin or small baking dish about 2 1/2 to 3 inches across. Put in a little butter. Then break in the eggs. Pour over the half-and-half or cream, which should almost cover the eggs. Dot with remaining butter, sprinkle with salt, pepper, and cheese. Bake in a preheated 375 degree oven for 7 to 8 minutes until the whites are set. This recipe is from the book Liberace cooks! 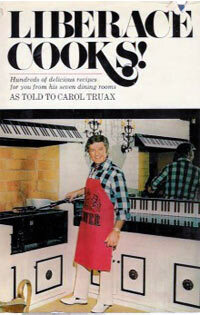 Recipes From His Seven Dining Rooms (Doubleday, 1970) by Liberace and Carol Truax. It can be purchased used at Amazon.com. Liberace was a famous, flamboyant pianist and entertainer known for his lavish costumes and opulent jewelry. He reached great success as a recording artist and performer. At certain points in the 1960's and 1970's, he was considered the highest-paid entertainer in the world. The interesting thing about these 15 minute eggs is that the cooking time is only 7 minutes. Recipe number 2951. Submitted 11/5/2010.